Thanks to their simplicity and classically proportioned doors and frames, our Shaker kitchens offer timeless appeal. 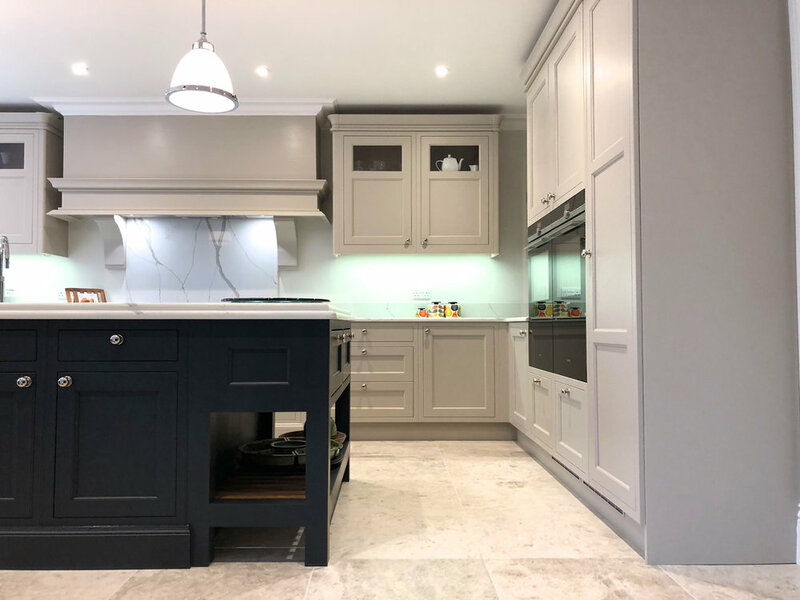 Coupled with traditional craftsmanship and a significant investment in new machinery and technology, your kitchen will also be built to withstand daily life for many years to come! You can see here in these photos, the infinite features available to you. 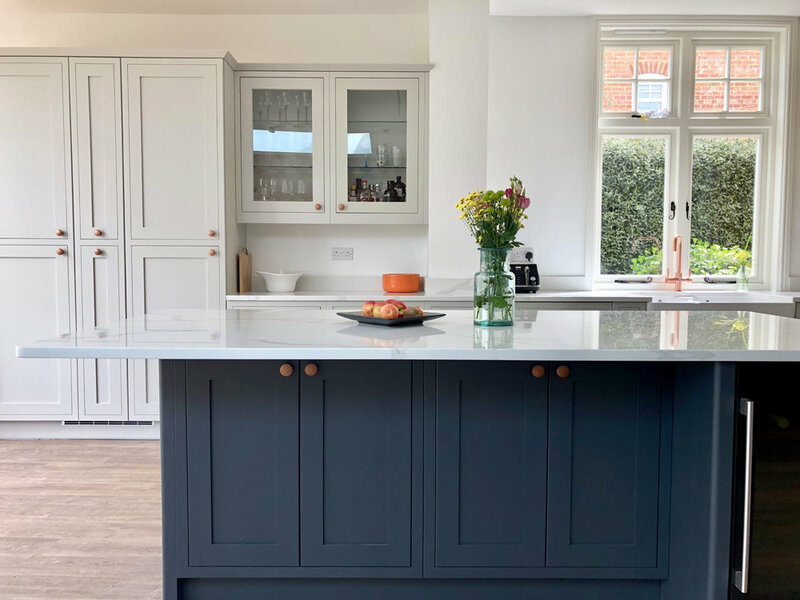 This first design shown, displays distinctive highlights such as brushed copper handles on our 2-colour painted Ash Shaker In-Frame with the paint finish chosen to bring a subtle grain through. 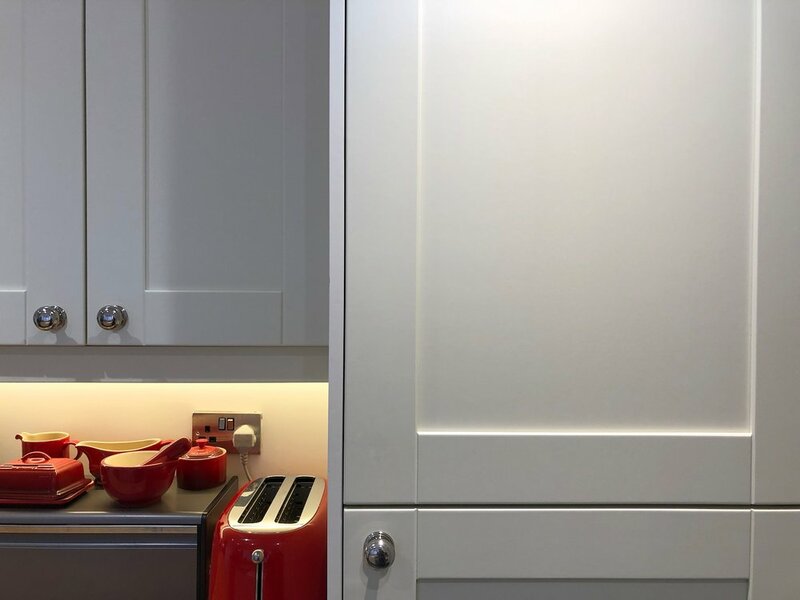 Our fully glazed wall cabinets can be designed in a number of ways, from the choice of glass itself and number of shelves, to the visible colour and finish of the cabinet interior. 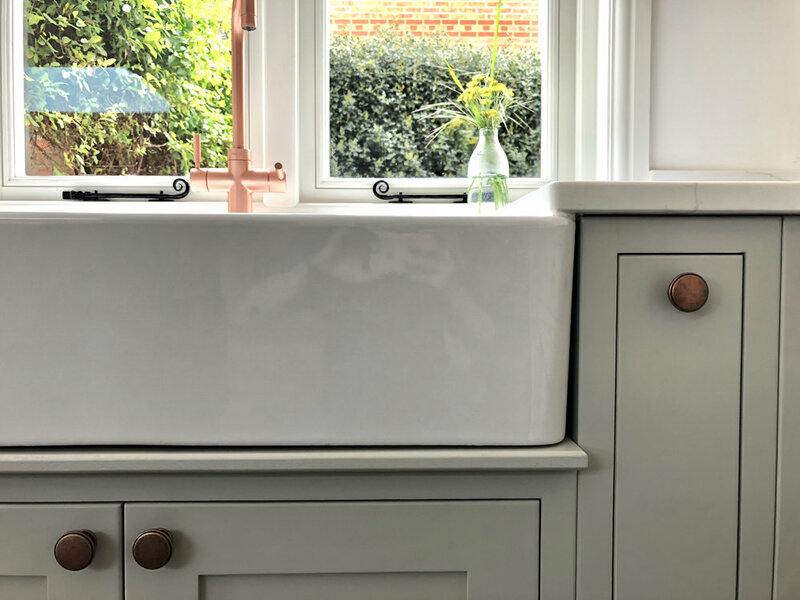 You will also see the hand-made dove-tail drawers, farmhouse sink and a number of clever storage ideas such as hidden tray-spaces, pull-out tea-towel rails and internal bin units. 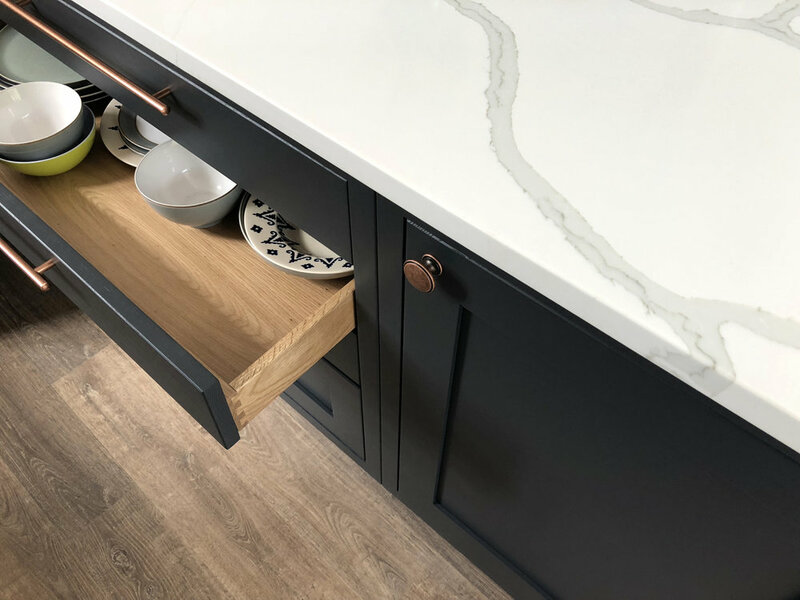 Our custom-designed solid block radius-ends are added to all external base corners which not only enhance the solid look of the kitchen, but also provide additional protection from the knocks of a busy household! You can choose traditional plain Shaker, Hilton with the subtle V-grooves added as seen above or Stafford detailing for example. You can even choose how deep you would prefer your centre panel to be, or how wide you would like your frame stiles and rails. A key feature to choose is that of a grain. No grain at all, a strong or subtle grain, or visible grain on the outer frame, with a smooth finish to the centre-panel. You can see in the photos above the popular choice for many customers where all doors and panels are produced with a completely smooth finish. 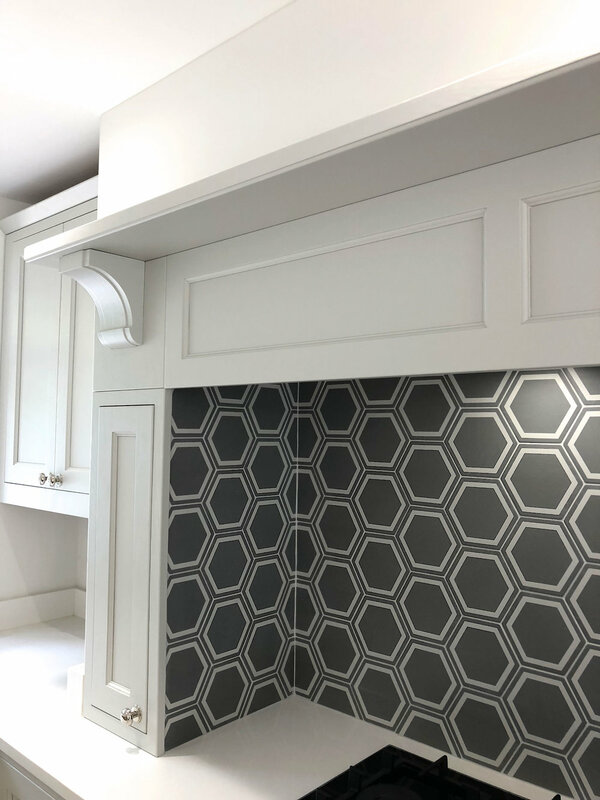 Sometimes we are given an interior design brief to work with, to harmonise traditional detailing with all of the conveniences of modern integrated appliances and this design demonstrates how this works very well. There are a variety of stunning details shown here, such as the large island with lowered breakfast bar at one end and a cook-end at the other. The furniture here was made in painted Ash, in the Stafford style which presents additional shaping within the rails and styles. 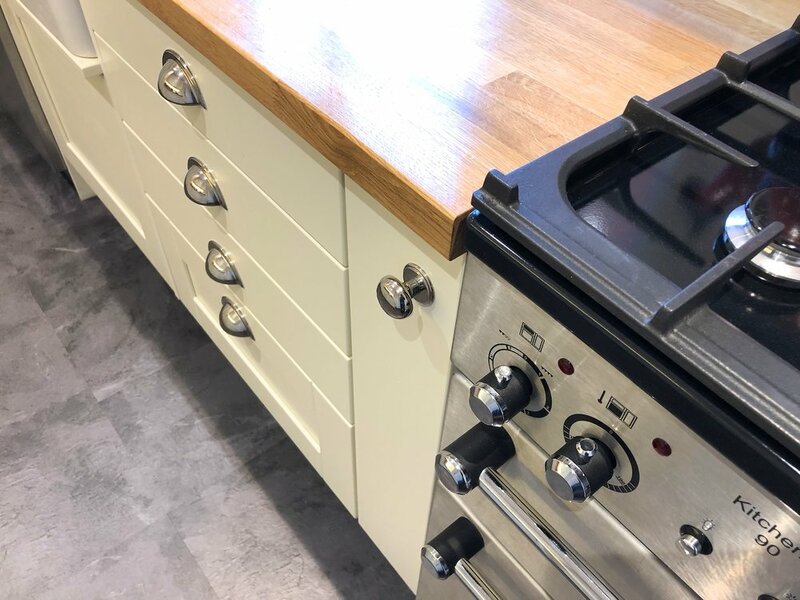 Also shown is the Alaska Composite Quartz worktops adding a distinctive grain and a half-bullnose edge with breakfront to the hob area, which links together the early century styling up to the double-stack cornice with rounded corners. Half glazed wall-cabinets, a hand-made canopy and block chunky shelves are made to create a feature corner as an alternative to wall cabinets. The walk-in pantry was also designed and made to exact measurements and all designed to fit this unique and challenging brief. 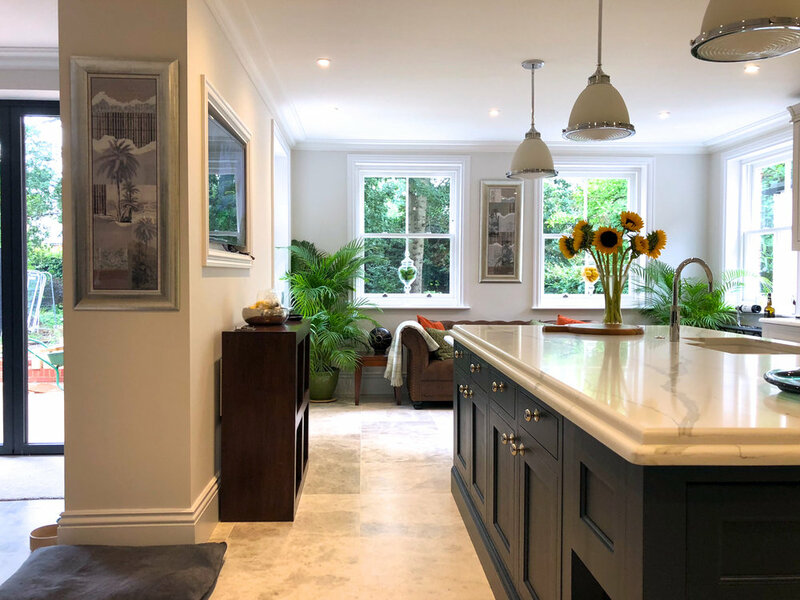 This kitchen in Berkshire was designed and built with a number of distinctive personal choices, from the completely unique style of the working mantle, the corbels, cornice and the pelmet. Everything chosen to suit the home owner’s preferences exactly. 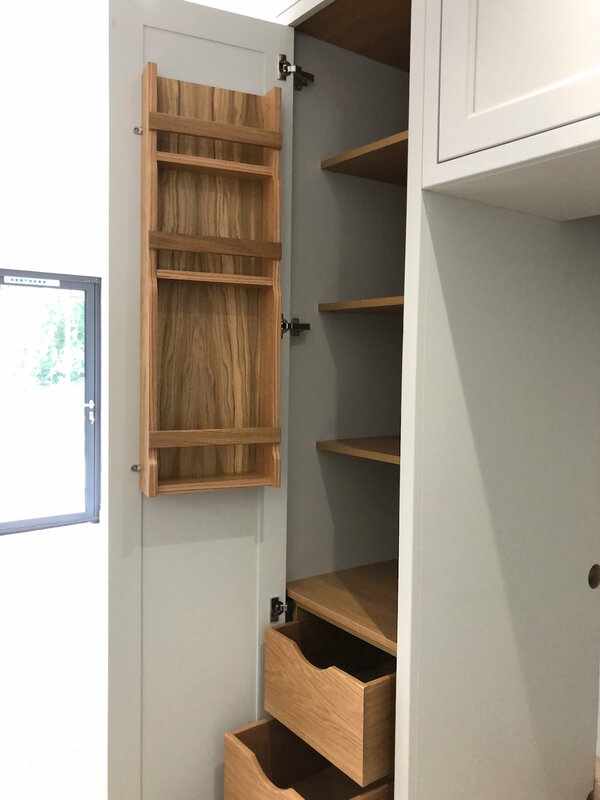 We were particularly proud of our clever idea for this tall corner cupboard. Again something that does not exist elsewhere. 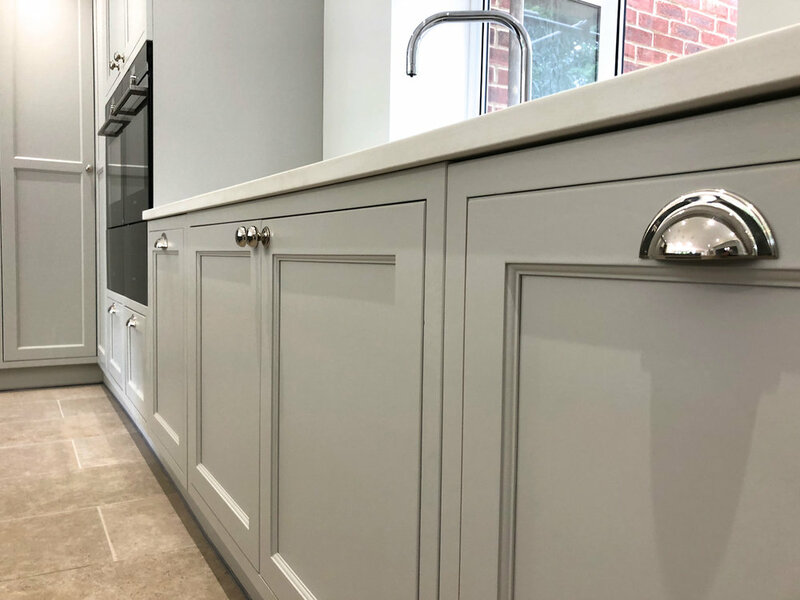 A genuinely bespoke kitchen will offer you the beauty of a kitchen that ultimately fits like a glove, without compromising over-sized fillers or panels that have to work to the retailer’s catalogue, rather than the varied measurements of your home. 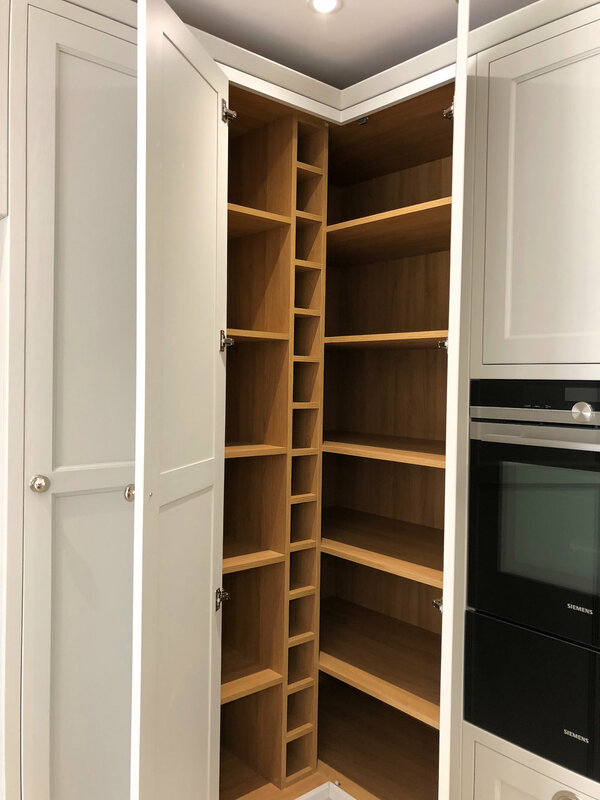 The tangible benefits of maximising every possible space through the creation of unique size cabinets and the creation of all features personal to you is what you and your home deserve. British made and with the finest branded European components. 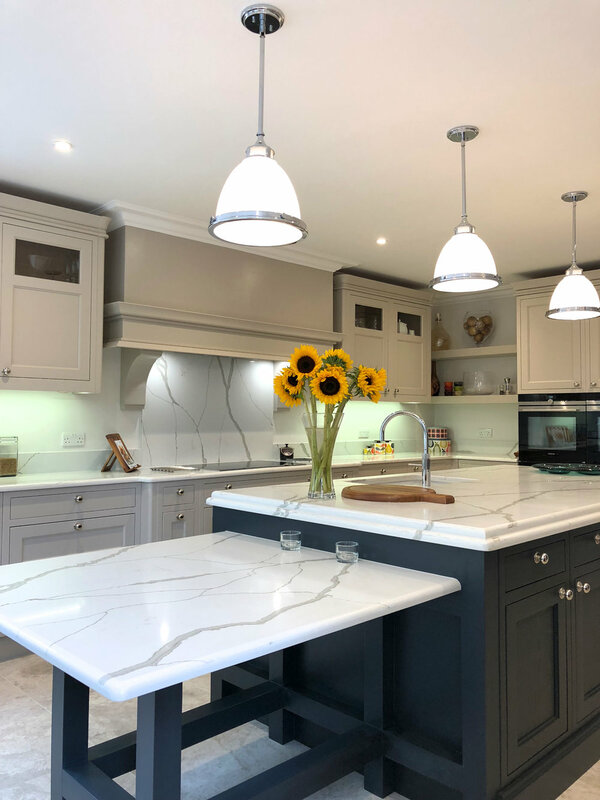 The best part is that all of this can be achieved through The Utopia Kitchens Bespoke Series at a truly unbeatable price-level you cannot find elsewhere. What you see here are all our own kitchens, installed locally. No room-sets or images copied from brochures. 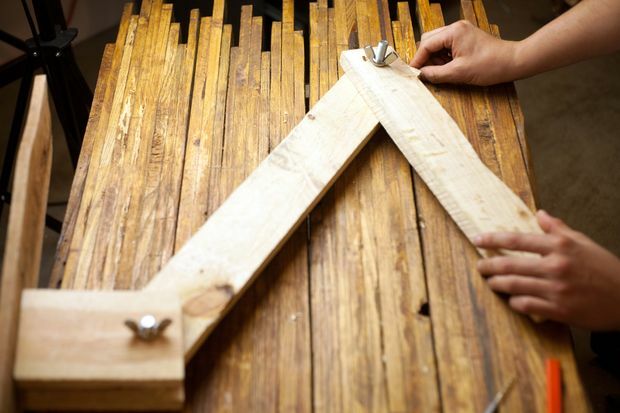 Instead we maintain our belief and confidence in the close-up detail of the design, material quality and the essential craftsmanship of our fitter’s decades of experience in cabinetry.